Korea is a small peninsula located in north-east Asia. The peninsula is attached to China from the north, and is located in the South China Sea, directly opposite Japan. Up until 1901, the peninsula was a self-governing empire, but in 1910 it was annexed by the increasingly expansionist Japanese Empire. After World War 2, Japan ceded Korea to the Soviet Union and the United States, the major international powers in the area, in order to allow an eventual change to self-government: attempts to form a single national government failed due to disagreement from both these countries. The nation was artificially divided along the 38th parallel, with the north going to the Soviet Union and the south going to the United States. A communist state was set up in the North, while a more capitalist US-friendly state was set up in the south. Both states claimed sovereignty over the entire nation. The problem of how these two states were to coexist was a thorny one. It became more relevant after the dust of World War 2 was settled, and civilian governments were established in both states. In the South, an election to the Constitutional Assembly was held under United Nations supervision. The Constitutional Assembly elections were the first democratic elections of any sort in Korea, and as such voters were somewhat uncertain about politics, and especially political parties. 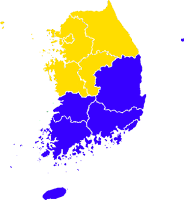 Two main political parties were set up, the National Alliance for Rapid Realisation of Korean Independence (NARRKI), a centre-right nationalist conservative outfit, and the Korea Democratic Party, a somewhat more liberal group. The electoral system was single-member plurality, a slightly puzzling decision on the part of the United States military administration. For an assembly designed to produce a consensus on a constitution, a majoritarian electoral system may not have been the best choice. Single-member plurality was also rare in the region; admittedly, the only country with democratic experience in East Asia at the time was, ironically, Japan, which used the single non-transferable vote. United States supported governments in Asia after the Second World War used a range of electoral system. Japan used the limited vote, before switching to the single non-transferable vote shortly after. Chiang Kai-shek's short-lived Republican government in China used the single non-transferable vote for legislative elections, although these were hardly democratic. Whether this was an attempt to export US political traditions to Korea, or a choice based off the need for simplicity, is unclear. The election results were interesting. Out of 200 seats, NAARKI won 55 seats and 26% of the vote (with 197 candidates), the Democratic Party won 29 seats of 13.5% of the vote (with 84 candidates), and the right-wing anti-communist Taedong Youth Party won 12 seats and 9.6%. The biggest group, however, was the independents. Independent candidates won 85 seats and 40.3%. The results showed some interesting regional trends. The Democrats were the largest party (excluding independents) in Seoul, where they won 20% to 9.3% for NAARKI, and 52% for independents, in Jeolla in the east, where they won 37% to 17% for NAARKI, and in Jeonbuk, south of Jeolla, where they won 27.2% to 26.8% for NAARKI. NAARKI dominated on the small island of Jeju, with 61% to 14% for independents (the Democrats did not contest), and in the northern province of Gangwon, with 47% to 30% for independents (Democrats did not contest). In the remainder of the country, independents dominated. These trends are still present in Korean politics today, if you consider the Democrats of 1948 to be the ancestors of today's liberal parties and NAARKI to be the ancestor of today's conservatives. A new constitution was written and approved by the assembly. Korea had little experience with democracy, and the draft was done by Chin O-yu, Korea University's only professor of constitutional law. O-yu's first draft called for a parliamentary system, which had the support of the Democrats. However, Rhee was strongly opposed to this sort of system, and used his considerable influence to order O-yu to head back to the drawing board. The rewritten constitution was based off a presidential model from the United States. Initially, the president was directly elected by the legislature, but an amendment in 1952 introduced direct election of the president using single-member plurality. The legislature, renamed the National Assembly, was to be unicameral and elected using the single-member plurality system. Under the constitution, the president nominated a candidate for Prime Minister. This candidate then had to be approved by the National Assembly, but was not responsible to the Assembly and served for the term of the Assembly. The President could appoint members of the cabinet without a vote of the Assembly, a significant departure from United States practice. In effect, this created a presidential system, with government not being accountable to the Assembly. Following the assembly election, a Presidential election took place. In the presidential race, held in the assembly, two main candidates nominated: Syngman Rhee of NAARKI, and Kim Koo, a member of the Korean Independence Party (a split from NAARKI). Rhee won decisively, with 180 votes to just 13 for Koo (134 votes were needed out of the 200 members). In the vice-presidential race, Lee Si-young won with 133 votes to 62 for Koo. Syngman Rhee was a staunch anti-Communist, and was supportive of military action to reunify Korea. However, Rhee's United States backers were wary of provoking the Soviet Union, and refused to give Rhee any heavy weapons. The North Koreans had stronger weapons, and in 1950 they invaded the South. The North took the capital of Seoul, and occupied much of the South, but a United Nations force of countries, headed by the United States, successfully repelled the Northern invasion, and headed up to the far north. A peace settlement created a border between the two countries, but the war did not officially end, and the relations between both countries were a hot issue. Both countries had one thing in common, though: massive political repression. In South Korea, opponents of Rhee were imprisoned, and tens of thousands of civilian government opponents were killed on such a scale that the US and UK commanders were forced to intervene. Similar, but obviously less public incidents took place in the North. Rhee was also notorious for his corruption. One of the most serious incidents, the National Defence Corps incident, when 50,000-60,000 conscripted soldiers starved to death because of a lack of resources for the military, was partly caused because cronies of Rhee had stolen five billion won, or AUD $140,000,000, from the military. A significant share of this ended up in Rhee's pockets. In the 1950 legislative elections, Rhee's parties did not do so well. The National Association, the renamed (renaming parties will become a theme in South Korean politics) NAARKI, which was led by Rhee, polled poorly, winning 6.8% and 14 seats out of 210. The Korea Youth Party, also apparently led by Rhee, polled only 3.3% and 10 seats. The vaguely oppositional Democratic National Party won 9.8% and 24 seats, while the Korea Nationalist Party won 9.7% and 24 seats. This has to be seen in the context of Independent dominance in this election; independent candidates won 62.9% and 126 seats. Rhee's term was due to end in 1952, and under the constitutional amendment passed by him, the election took place directly. The Korean War, which was taking place at the time, galvanised support for Rhee, who ran as the candidate of the Liberal Party (the renamed National Association). Rhee won 74.6%, to 11.4% for socialist independent Cho Bong-am and 10.9% for former vice-president (who had resigned over the the National Defence Corps incident) Yi Si-yeong, who ran as the candidate of the Democratic National Party. However , the election was not a clean sweep for the Liberal Party; the Liberals failed to win the vice-presidency by a wide margin. The aim of the Rhee government in this era was to make amendments to the constitution to give the president even more power. To do this, he aimed to win two-thirds of the seats in the National Assembly in the 1954 elections for his Liberal Party. In the election, Rhee won 114 seats and 36.8% of the vote; 22 short of the majority he sought. The Democratic National Party polled poorly, winning 7.9% and only 15 seats. Independents won 47.9% and 68 seats. Rhee needed more votes, and he decided to try and induce some Independents into the Liberal fold. At this, he was successful. The amendments abolished the position of Premier, thus removing any Assembly control over the executive. Rhee's main objective, the abolition of the two-term limit, was approved. This gave him virtual complete control over South Korea. Angered by this, the opposition parties reformed into a new party; the Democratic Party. The party nominated Shin Ik-kee for the 1956 presidential elections by vote at their convention, but Ik-kee died of heart failure after the close of nominations, meaning that Rhee was only opposed by the weaker Cho Bong-am. The Democratic Party were able to win the vice-presidency, however; Chang Myon won with 46.4% to 44% for the Liberal candidate. Three years after this election, Bong-am was convicted of violating the National Security Law for his leftist activities, and was executed. The Democrats improved their strength in the 1958 National Assembly election. In an expanded 233-member assembly, 126 members of the Liberal Party were elected off 42.1% of the vote, a loss of 5 seats from 1954 despite a gain of 5% of the vote. 80 Democrats were elected, and the party won 34.2%, a gain of 26% from the Democratic Nationalist performance in 1954. The big losers of the election were Independents, who lost 26% of their vote and 41 seats; a sign of a consolidating party system. Rhee had once again failed to win a two-thirds majority. The increasing frustration of the Liberal Party at the stubbornness of the voters to award them a two-thirds majority led the party to resort to further abuses of power in order to ensure that they would remain in government. A poor economic situation led to a further decrease in Liberal support. As the 1960 election loomed, Rhee faced a polarised electorate. In March 1960, Korea went to the polls to elect a president. Rhee was unanimously renominated as the Liberal candidate, but the Democratic nomination race was decided by four votes; Cho-byong Ok was nominated by four votes over vice president Chang Myon. However, Ok died before the election just after the close of nominations (of cancer, believe it or not), thus meaning that Rhee had no opponent. Attention now shifted to the vice-presidential race, where incumbent Democrat Chang Myon was facing off against Lee Ki Poong, the Liberal candidate. When the votes were counted, Poong won a suspiciously large victory; 79.8% for him, 17.5% for Myon. The Democratic Party was rightly suspicious of this result. Reports of Liberal gangs intimidating voters and fake ballots marked for Poong were circulating, and many historians have stated that the Ministry of the Interior simply made up the election result. Democrats refused to accept the vote, and protests against the Rhee government began. The reaction of the Rhee government to the protests was violent. Government police cracked down on the protesters, but that only fuelled the fire. On the 26th of April, Rhee was forced to resign, and as protesters headed for the Blue House (the lovely residence of the Korean president), he boarded a United States helicopter and flew to Hawaii, where he accepted asylum. The legacy of the First Republic is an uncertain one. The rapid consolidation of power with Rhee was something that could hardly have been expected by constitutional designers, but the lack of checks and balances built into the constitution meant that it was possible. Korea needed a democratic system based around consensus building. While it would be advisable not to give too much power to an assembly with a weak party system, as the National Assembly was during the First Republic, it is clear that the scales were balanced heavily in favour of the President. With Koreans wary of a presidential system following the excesses of the Rhee government, the decision was made by the Democratic Party, the pre-eminent political force following the revolution to move in the opposite direction entirely. The new constitution called for a figurehead president, who would have no power. The real power would rest with a bicameral parliament, based on the Japanese model. The lower house, also called the National Assembly. would be elected using the single-member plurality system, just as under the First Republic. However, the upper house, also called the House of Councillors was elected using party-list proportional representation in constituencies with an average district size of 6. The National Assembly elected the prime minister, and the government was responsible to the National Assembly. The House of Councillors voted on legislation only. In the first legislative election, the Democratic Party dominated, winning 41.7% and 175 seats (out of 233) in the National Assembly and 51.4% and 31 seats (out of 58) in the House of Councillors. The much reduced Liberal Party won just 2.8% and 2 seats in the Assembly and 6.1% and 4 seats in the Councillors, while the new left-wing Socialist Mass Party won 6% and 4 seats in the Assembly and 1.4% and 1 seat in the Councillors. The discrediting of the Liberal Party had breathed new life into the independent movement. Independents won 49 seats in the Assembly, a gain of 22, and won 46.8%. Independent lists won 36.8% in the Councillors, and 20 seats. Following the legislative election, a presidential election took place in August. Yun Posun, the Democratic candidate, was elected by a joint sitting of the Councillors and the Assembly. In this election, a two-thirds majority was required to elect a President. This mechanism, which was also part of the Republic proposal for Australia in 1999, was presumably designed to elect a consensus candidate. The Democrats had the votes to elect a president, though. Yun Posun was elected with 82% of the vote, while his nearest competitor, Confucian leader Kim Chang Sook, won just 11.5%. No other candidate came close to double digits. Most power in the new republic, however, rested with new Prime Minister Chang Myon. Myon, however, had a lot on his plate. He inherited a country with a collapsing economy based around US aid, massive inflation, and a corrupt bureaucracy. The citizenry had high expectations of his government. Myon was not helped by a serious split within the Democratic Party. 60 members of the National Assembly and 18 members of the House of Councillors left the Democrats to form the New Democrats (thus winning the 1961 Award for Excellence in Creative Party Naming). This left the Democrats in a minority position in the upper house. Many, many protests were held during the Second Republic. Myon was forced by his allies in the Democrats to sack certain corrupt civil servants, thus angering a significant number of powerful people. Despite this, many military leaders who were accused of backing Rhee were kept off the sacking list, which many people blamed on Myon. He also publicly mused over whether the military budget should be cut, which again irritated a significant number of powerful people. Of course, irritating a significant number of powerful people in a country with a weak democracy and a strong military is not a recipe for success. With the Myon government failing to control inflation and the economy (unemployment was at 23%), and with furious protesters angrily calling for political reforms, the Second Republic began to collapse. The police, filled as they were with hangovers from the Rhee era, were unwilling to enforce law and order at the behest of the Myon government. On May the 16th in 1961, a mere eight months after the formation of the Second Republic, Major General Park Chung-hee announced that he would lead a military mutiny to try and unseat Myon. He formed the Military Revolutionary Committee, and occupied the Korean Broadcasting Corporation centre. This committee's first action was to prepare a broadcast informing the citizens that their new government would focus on anti-communism, economic development, and Korean reunification. Notably, 'democracy' was not on that list. Park ordered the special forces to march on the Blue House, but by that time the Second Republic had collapsed. Chang Myon had fled Seoul, and Yun Posun put up no resistance. Posun was retained as President, but with no power, and South Korea fell under the control of the Supreme Council for National Reconstruction, the renamed Military Revolutionary Committee. So, what to say of the Second Republic? Well, it faced an uphill struggle from the start. It was a government responsible on almost all issues to an assembly, which restricted its leaders' ability to make unpopular economic choices. It faced a civil service dominated by hangers-on from the Rhee era who were at best lukewarm about democracy, and a massive military whose leaders were angry at the lack of economic progress, not to mention students emboldened by an increase in political freedom equally angry at corruption and a lack of political reforms. A pure parliamentary system with a weak party system created instability in a country where stability was badly needed. While the Democrats used their position as a 'big-tent' party to take control of the new government, the fact remained that this position was unhelpful in a pure parliamentary system, as the split showed. Under the rule of the Supreme Council for National Reconstruction, South Korea was in no way democratic. The Council held complete control over the government. They used this position to crack down on leftist dissidents, and to introduce a five-year economic plan (proposed by the previous government). No elections took place under this government. The outgoing military leaders, including Park Chung-hee, wrote up a new constitution in 1962, and promised that he would not seek election for the new democratic government (and if you can't trust the word of an unaccountable and all powerful dictator, who can you trust?). A referendum was held on the new constitution in late 1962. With no certainty of what would happen if the majority voted no, 81.6% of people voted Yes, and the constitution was enacted. The new constitution called for a presidential system of government, with an elected unicameral National Assembly. The president would be directly elected for a 4-year term using the single-member plurality system, while the National Assembly would be elected by a rather odd system. 2/3 of members would be elected using single-member plurality, while 1/3 of members were elected by party-list proportional representation. However, instead of votes, the proportional representation count was counted based on the number of seats won in the single-member plurality count. This effectively created an extension to parliament that did not alter the proportion of seats. Also, the largest party in terms of votes would be given 50% of the list seats, and the remaining seats would be distributed amongst the other parties. Why make this seemingly pointless change? Well, one reason that this might be done is to increase the size of parliament without either redistributing or introducing a proportional list system. However, the size of the National Assembly actually decreased under the new constitution, so this couldn't be the reason. The reason seems to have been to take advantage of one feature of closed-list proportional representation (the ability to sneak candidates into parliament without the scrutiny of even a safe seat), without the annoying fair treatment of small parties. The President can propose bills to the National Assembly (a significant deviation from the US system), and can veto legislation. Vetoes can be overruled by a vote of 2/3 of the National Assembly. Powers to make war and to make emergency decrees existed, but these could only happen with the concurrence of the Assembly. The President could appoint certain high officials. The powers of the National Assembly over the executive were fairly weak. The National Assembly had to approve the budget, and to conduct investigations into government. However, the Prime Minister and the Cabinet were appointed by the President, and were not responsible to the Assembly. This created, in effect, a pure presidential system. The first elections under the new republic took place in October 1963. Despite promising not to, Park ran for President as the candidate of his own right-wing Democratic Republican Party. The other major candidate was Yun Posun, the President of the Second Republic, who ran as the candidate of the candidate of the more liberal Civil Rule Party. The election showed interesting regional trends, as the map below shows. As you can see, the north of the country was supportive of Posun, and the south was supportive of Park. Most regions were comfortably in one camp or the other; only Busan (the small bit in the south-east) had the difference between the two candidates under 5%. In November, the legislative elections took place. Park's Democratic Republican Party won 33.5% of the vote and 110 seats in the 175 member Assembly; 22 list seats (out of 44), and 88 district seats (out of 131). Posun's Civil Rule Party won 20% and 41 seats; 14 list and 27 district. The reformed Democratic Party won 13.5% and 14 seats. A significant portion were from Seoul. The Democratic Republican party benefited from the split of votes between the liberal parties; they won 63% of the seats off 33.5% of the votes, thus being over-represented by 30%. With the Korean party system being the Korean party system, some changes took place in the 1963-1967 parliamentary term. The Civil Rule Party, the Democrats, and the Liberal Democrats merged into the New Democratic Party, which continued the legacy of moderate liberalism. In 1967, another election was held for the presidency. An improving economy allowed President Park to win more comfortably, with 51.4% to 40.9% for Posun as the New Democrat candidate. The National Assembly elections resulted in an equally comfortable Democratic Republican majority; the party won 50.6% of the vote and 129 seats, while the New Democrats won only 32.7% and 45 seats. Only Seoul really bucked the trend; out of 14 Seoul members, 13 were New Democrats. The consolidation of the liberals meant that the Democratic Republican Party was actually less overrepresented than in 1963; the difference between their vote share and seat share went down to 23%. In 1971, the date of the next Korean elections, the situation in Asia was looking favourable to the Communists. US President Nixon had increased ties with Communist China, and, while not formally breaking diplomatic ties with them, had made it pretty clear that he wouldn't be backing the Republican Chinese (a.k.a Taiwan) for much longer, as their relevance faded. The communist North Vietnamese were starting to gain the upper hand in the Vietnam War, and pro-US governments in Cambodia and Laos were facing communist insurrections. In this context, President Park became paranoid about the possibility of an invasion from the North. Another factor was the constitution. In its original form, a two-term limit was created for the presidency. However, Park was unsatisfied by this, and held a controversial referendum to abolish this. 67.5% voted Yes, and 32.5% voted No. Despite this, elections did take place in 1971. Park faced stiff opposition for the presidency from Kim Dae-jung, a former member of the National Assembly. Park won 53.2% to 45% for Kim, a fairly good score given that Kim faced certain legal hurdles put in his way by the government. Interestingly, Kim won a majority in towns with a population over 50,000; Park's victory came from rural areas. The legislative election result was another win for the Democratic Republicans; they won 48.8% and 113 seats in an expanded 204-member National Assembly. However, that was a significant fall from 1971. The New Democrats won 44.4% and 89 seats, almost doubling their seat count. This increased Park's worry; he saw Kim as a threat to the existing constitutional order. Shortly after Park was sworn in for his third term, he declared a national State of Emergency. Part of this seemed to come from the international situation, but part of it came from mounting concern about North Korea. Park had approved talks with senior North Korean officials, and learning about the situation worried him. The strong performance of the New Democrats further convinced him that he needed to make changes. The Third Republic constitution was fairly effective, as Korean constitutions went. It provided for a relatively stable government, and did not give too much power to the president. A bigger issue was the influence of the legislature over the executive, and it seems that Park did not want the National Assembly to have much power. At this point, the Korean political system was like a pendulum, with the power swinging from the presidency to the legislature, and back to the presidency. But with Park making the rules, the next constitution would be somewhat different.